Part of what makes Salesforce (and really the whole SaaS model) so great is the ability to constantly evolve and improve. Last year, we saw a major change through Salesforce Lightning Experience. 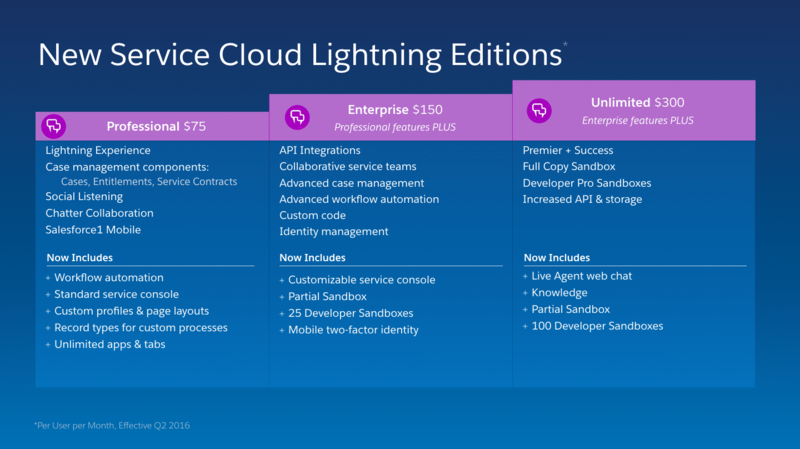 This year, Salesforce is coming out with new Lightning Editions in May 2016. This blog post addresses the questions around the change. 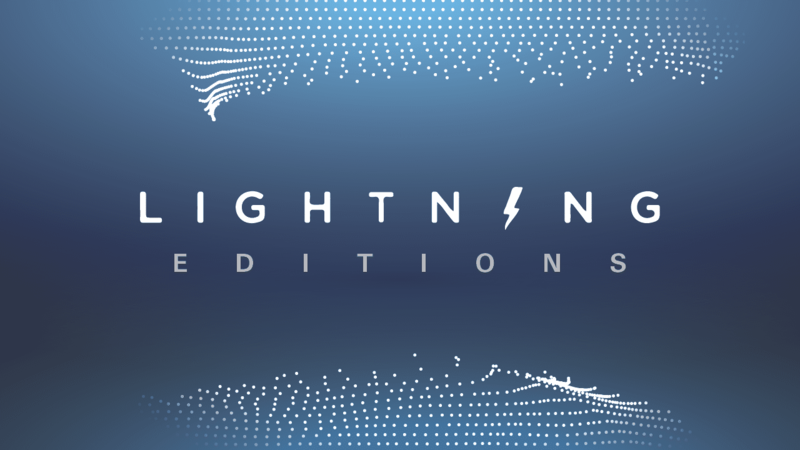 Q: What do the new Lightning Editions have to do with Lightning Experience? A: Other than the fact that the features in the new editions can be used in the Lighting Experience UI, nothing really — they can be used in Classic just as well. 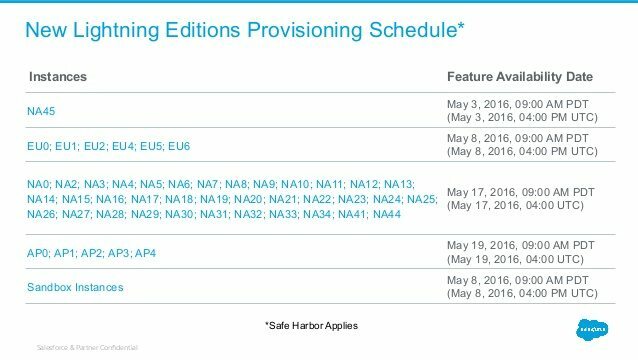 Q: Why is the word “Lightning” part of the editions’ names? A: It is a way to brand products and it indicates that the Salesforce sees its future (and, to a degree, present) as using all things Lightning: Lightning Experience, Lightning Process Builder, Lightning App Builder, Lighting Editions, etc. Not to worry though, the “Classic” interface is not going away in the near future. Q: So what are Lighting Editions then? A: It’s a way to repackage existing products (Professional, Enterprise, and Unlimited editions), adding more features to each. Q: What new features am I getting? A: It depends on what edition of Salesforce you are currently on. The charts below show new features per edition. 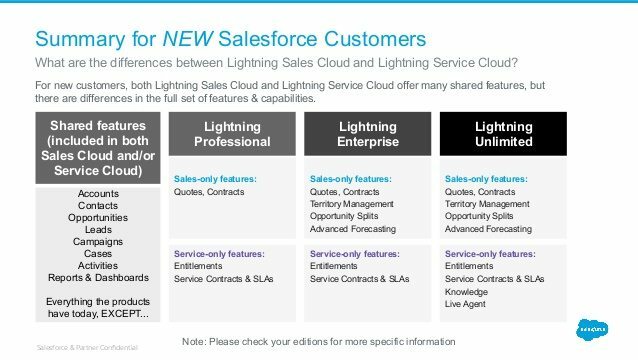 Q: When is my Salesforce org being upgraded to the Lightning Edition? A: The schedule is outlined in the chart below and can also be found at this link. Q: What about customers who will be getting a brand-new Salesforce org? Q: Will there be any downtime with the provisioning schedule? A: There will be no downtime. The transition will be organic, without any service interruptions. Q: Do I have to pay extra for the new features? A: The new features do not come with a price increase. 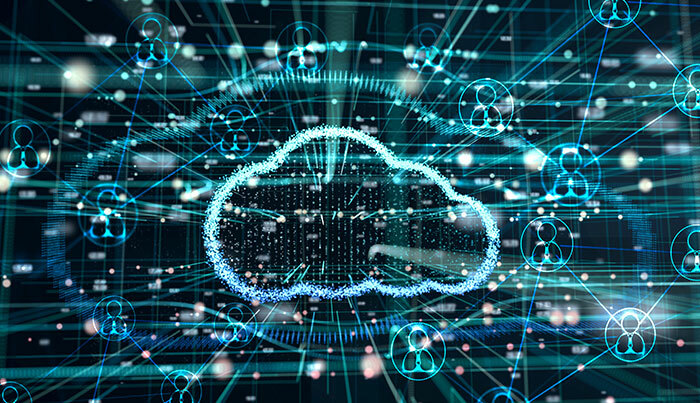 Usual price increases may apply, those that sometimes happen when Salesforce contracts are renewed, but this is no different from what was happening before the new Lightning Editions were introduced. 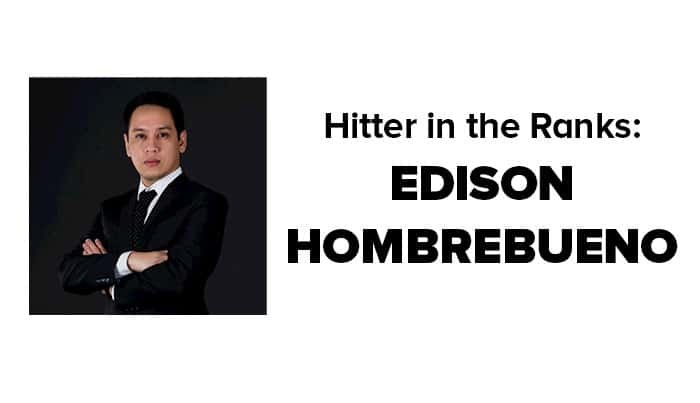 As always, your Salesforce account executive is the best source of information on Salesforce pricing for your organization. Q: Do the new features need to be enabled? A: The new features will seamlessly appear in your orgs, ready to use. Q: Since new functionality is being added, will any existing features be lost? A: No loss of functionality for existing customers will happen, and all current features will be retained. This, in a nutshell, is a summary of information and most frequently asked questions about the new Lightning Editions. If you have additional questions, please contact us at 855.256.8391, email us at [email protected] or reach out to us on Twitter @Simplusnow. 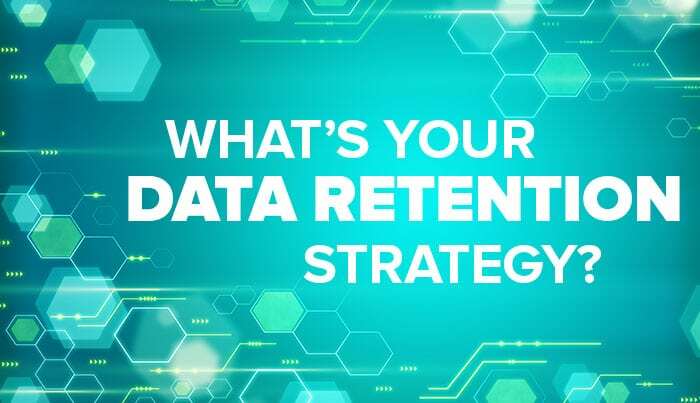 You need a comprehensive data retention strategy.